A 54 foot research vessel with a 4,000 lbs A-Frame, two 20 kW Generators, computer lab, ample deck space, full galley and only four foot draft makes the R/V Lakota one of our most versatile vessel in the fleet. She is our largest boat and will be able to satisfy your most challenging scientific work. A 32 foot work boat with a 18 foot A-Frame and 2,400lb winches. Walter is often employed for Vibracore sampling as well as Turbidity Curtain installations. Our Derrick Barge utilizes a pedestal mounted Bucyrus Erie Crane. With a load of 44,000lbsf, the predicted maximum heel angle is 7.1 degrees, occurring at a maximum operating radius of 80ft. For dredging operations she is outfitted with either a 5yd digging bucket or a 7yd transfer bucket. Our largest hydraulic dredge, the 'J-D' is outfitted with two swing winches,which allows the dredge to be converted from a swinging ladder dredge to a conventional dredge. It features a closed loop hydraulically driven underwater pump, a PLC based operating system and stern kicker spud for dredge advancement and positioning as well as GPS and Hypack/Dredgepack navigation. The Moray was designed to be a 'highly mobile' dredging platform which retains exceptional performance. It features a closed loop hydraulically driven underwater pump, power up/down winches with API rated drums for proper cable storage, a PLC based operating system and stern kicker spud for dredge advancement and positioning as well as GPS and Hypack/Dredgepack navigation. A 30 foot jet boat built for speed. On her rear deck she has ample room to maneuver equipment, this vessel can get you to your research site in a hurry and have the muscle to do some more challenging work for a boat of her size. Already geared for surveying, she will also be able t take sediment samples and is perfect for near shore sampling with only a 2 foot draft. 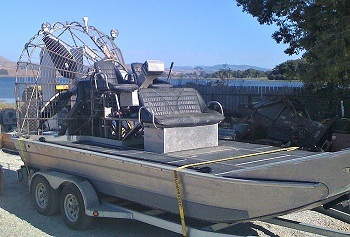 The DMS Hurricane is an 18' Welded Aluminum Airboat equipped with a 750HP LS7 427 SC Engine built by Mast Motorsports. This is an 18 foot “Four Wheel Drive” boat that will get you anywhere, literally! She is designed to move you across the grassland and mud flats almost as well as it goes through shallow swamps or skims across the deep water. The Air Ranger has been utilized in many applications where normal vessels and vehicles can not get to. She is very versatile and is currently configured with a 500 lbs. removable A-frame which can be use for 2-3 inch sediment cores. This is an 18 foot aluminum work skiff that is an excellent addition to the fleet. She is our primary single beam survey boat; rugged and reliable, she is able to take a beating on the hardest job.